famous fairways designed by the legends of the sport. Ready to drive some new fairways? Daytona Beach’s close proximity to Orlando and Central Florida attractions makes it an easy 2-3 day escape -- and discounted golf packages offer unrivaled rates. You’ll discover outstanding courses that offer challenges for every skill level. It’s why Golf Digest ranked Daytona Beach in the nation’s top 15 places to play. Want to play where the pros play? The LPGA International hosts events throughout the year and offers two championship courses, both recipients of a four-star rating from Golf Digest. The signature Rees Jones course offers 7,088 yards of links-style play, while the Arthur Hills-designed course will challenge you with generous water and sand hazards. Tee off surrounded by majestic live oaks and see a wealth of wildlife at the DeBary Golf & Country Club, a National Audubon Society-certified bird sanctuary. 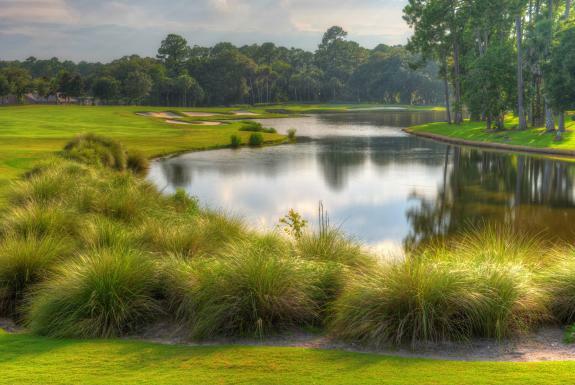 Cypress Head Golf Club is a public golf course in Port Orange and is widely praised for its conditioning. Or revel in the scenic fairways of the Pelican Bay Golf Club. Planning your golf escape is easy! Daytona Beach Golf’s discounted golf packages provide big savings on Daytona Beach’s best accommodations and courses. Check out DaytonaBeach.Golf for the latest in golf packages.